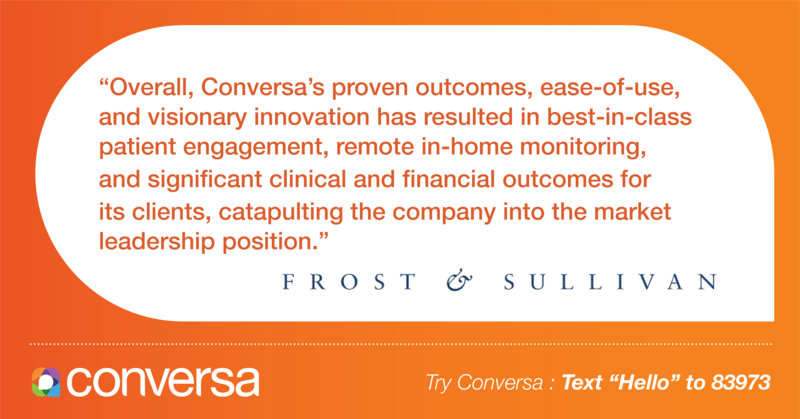 SANTA CLARA, Calif. — September 18, 2018 — Based on its recent analysis of the North American patient engagement solutions market, Frost & Sullivan recognizes Conversa Health (Conversa) with the 2018 North American Technology Leadership Award for filling the gaps in traditional care through its automated, artificial intelligence (AI)-based Conversa Conversation PlatformTM. This consumer-centric platform optimizes patient engagement, care team satisfaction, and clinical and financial outcomes through targeted patient outreach and coordinated care management. Clients use Conversa in a range of applications including chronic condition management, pre- and post-surgery, medication adherence, patient acquisition/retention and lifestyle health coaching. This allows caregivers to offer educational content and insights to foster an understanding of disease processes and reduce patient anxiety. Additionally, Conversa uniquely employs a proven motivational psychology methodology, wherein self-determination and superior patient-generated health data (PGHD) integration supports personalized conversational experiences and spurs patient engagement. Conversa’s structured approach further ensures high data integrity and minimizes escalations. In fact, it has a library of more than 500 conversation programs addressing conditions such as asthma, chronic obstructive pulmonary disease, and hypertension; this branching logic and structured data helps it present an easy-to-use client interface. In addition, the solution delivers a gamification feature to interact with patients, and providers can even adjust the literacy level and language according to their patient’s needs. Each year, Frost & Sullivan presents this award to a company that has developed a pioneering technology that not only enhances current products but also enables the development of new products and applications. The award recognizes the high market acceptance potential of the recipient’s technology.